Knoco stories: What does a Director of Knowledge Management for a legal firm do? What does a Director of Knowledge Management for a legal firm do? This month there were two "Director of KM" jobs advertised on linked-in. Let's see what this job entails. "Knowledge Management" is a poorly defined term, and Knowledge Management jobs can range from low level data-entry clerks to high level strategic posts, and anything in between. However when you see "Director of Knowledge Management" vacancies, that tells you that this is a high level post. One of these advertised vacancies gives few details of the post, but the second, from CMS (the legal firm) gives a full list of responsibilities and characteristics. 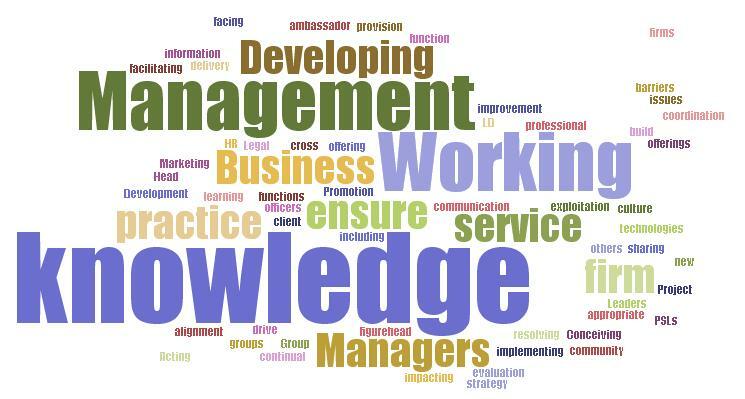 Conceiving, developing and implementing the firm’s knowledge management strategy. Promotion of a knowledge sharing culture. Acting as an ambassador and figurehead for knowledge in the firm. 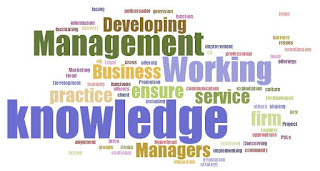 Working with the Head of Knowledge to drive continual Knowledge Management service improvement, including the evaluation and exploitation of new technologies and resolving issues and barriers impacting on Knowledge Management service delivery. Developing a cross firm knowledge community through facilitating communication and coordination between PSLs, information officers, Legal Project Managers, Business Managers, IT and others. Working with Practice Group Leaders to ensure appropriate provision of Knowledge to the practice groups. Working with the HR and L&D functions to ensure alignment of professional learning and Knowledge Management offerings. Working with the Marketing and Business Development function to build a client facing knowledge offering. Prior experience of being a qualified lawyer prior to entering into a KM role. A minimum of 7 years’ KM experience operating at a senior level. A naturally confident leader and strategic thinker able to assess the firm’s future needs and align KM initiatives accordingly. An interest in, and knowledge of, technological advances and their potential impact on knowledge systems. A creative and commercial thinker who will come forward with new ideas and approaches. An ability to motivate and persuade lawyers to contribute knowledge and learning assets. A consultative approach – the ability to communicate effectively on both a practical and academic level with a willingness to listen. Experience of operating internationally and prepared to travel. Experience of creating and implementing new programmes and policies within a budgetary and time-critical framework. Advanced managerial skills with the ability to negotiate with and persuade others, not in direct line of report and working in close partnership with internal clients. Excellent communication skills with fluency in English, both written and spoken. Additional language skills would be an advantage. Ability to operate and succeed in a fast-paced, highly intellectual, multi-tasking, client-service orientated environment. A team player with a 'can-do' attitude and a passion for excellence. The responsibilities here are pretty generic, and not restricted to the legal sector. A Director of KM in any organisation would do much of this activity. However being a legal firm they are looking for a lawyer to take this role. Legal KM is insanely difficult outside the common law jurisdictions such as the UK and the US. I'm currently KM for a local law firm in the UAE, and am about to leave my position, as it has become practically untenable to continue. There is no support from higher management, investment in systems is minimal, and I have no administrative assistance. Quite frankly, it's Sisyphean. Wow, that's tough. Good luck with your job hunt - hope you find something much better. Being a KM is challenging if company culture is narrow like the one you are facing. Bad for them, they are missing the opportunity to be leader over the time. Good luck for your job hunt!